Get More Out of Your Techs TODAY! 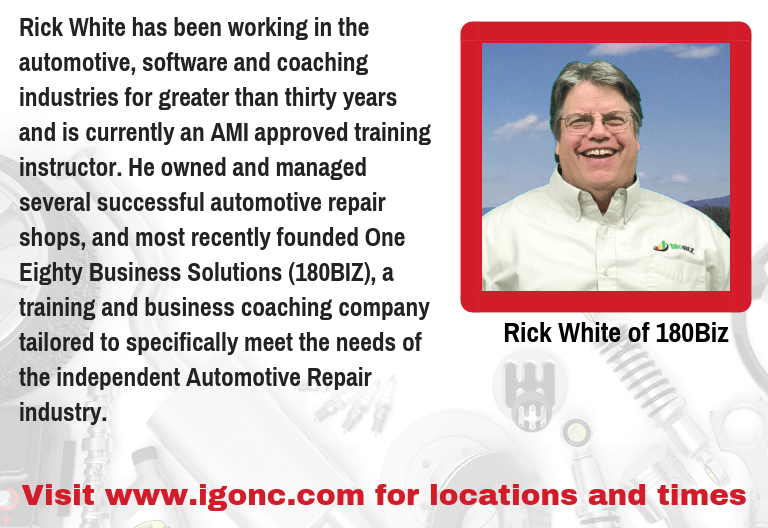 The average repair shop technician creates 5.6 billable hours each workday. These same techs will work an average of 8-10 hours that same day. When you opened your shop did you dream of just getting by? Just hoping to get your bills paid each month? This is so fixable! The answer is simply clear communication and meaningful expectations. In this webinar you will be learning the tips for setting clear expectations as well as “gain” strategies for getting more output from your techs. Implement these strategies and watch your hours go up, up, up! Whether the person’s job title is service advisor, service writer, ASM, or service consultant, it is imperative that there is a clear understanding of the person’s primary mission – to ensure that every customer is driving a safe and reliable vehicle. Hiring the right type of person is the first step but ensuring that your advisor understands his role and providing the key education and working environment is key to your business success. Attendees will learn:  Why service advisors are key to business success.  Best practices for service advisors.